Leader of the Peoples Democratic Party (PDP) in Lagos State and former Deputy National Chairman of the party, Chief Olabode George, has reacted to the raging allegations of money laundering, fraud and tax evasion against Alpha Beta Consulting, a firm with exclusive right to collect taxes on behalf of Lagos State Government since 2002. 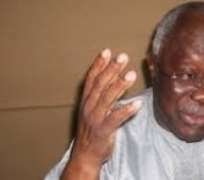 George, This Day reports, has said he hopes the Economic and Financial Crimes Commission (EFCC) would have the courage to find out the truth. Alpha Beta is linked to the National Leader of All Progressives Congress Asiwaju Ahmed Tinubu, who has no love lust with George. According to the report, Adetunji Adegboyega, who is the lawyer to the man behind the revelations, the former managing director of Alpha Beta, Dapo Apara, has said more disclosures would be made available to the public concerning the alleged N160 billion Lagos taxpayers monies allegedly cornered by the company. “All of them who had shared of the rot must be exposed. It will redeem the credibility of the EFCC. But first, they must shut the place down and a law enacted that no one must collect revenue on behalf of the state again and everyone involved must be exposed,” George stated. Meanwhile, EFCC has acknowledged receipt of the petition written against Alpha Beta by Apara. It stated that it was undergoing processing and evaluation just like other petitions before deciding the next step.